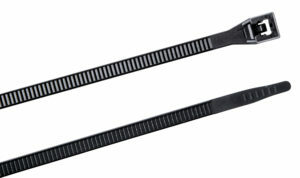 Gardner Bender’s Patented Double Lock Cable ties are designed for strength, durability and reliability. Ideal for all bundling purposes; wires, cables, hoses, or ducts, you name it, and these ties will bundle it. Made from durable 100 percent nylon 6/6 material, these ties feature our patented Double Lock design, with locking teeth on both sides of the tie and at the head ensuring a stronger connection and 50 percent greater tensile strength than the industry standard. The bent tip ensures easy insertion into the tie head while close serrations on both sides of the tie promote precise adjustment. The smooth radiused edges ensure easy “slip” as you tighten while finger grips on the end ensure a secure and comfortable grip when hand-tightening. Investigated using particular requirements that allowed it to be a UL recognized component and with a serviceable temperature range from 0 deg C to 85 deg C (32 deg F to 185 deg F) these ties are designed to last. If you want a high quality product that will fulfill all your application needs, then choose Gardner Bender Double Lock cable ties. Heavy-duty zip ties are hard-wearing and designed for rugged industrial, automotive, and farm/ag applications demanding high levels of tensile strength and large bundle diameters. Permanently secured until you cut them off GB ties lock tight without stretching or sliding. The thick nylon 6/6 material and patented one-piece, injection-molded construction eliminates failure due to parts working loose or breaking off. Raised ridges on the cable ties bent tips are designed to provide a secure grip while requiring minimal effort to close and the strong locking head ensures the increased tensile strength you need. Ideal for ducts, temporary fencing, heavy equipment, and vibration prone areas in both electric and non-electric applications, including home repairs, remodeling, kitchen, or bathroom renovations in residential and commercial locations. When you’ve got a big job that demands a strong tie able to handle a large bundle diameter then count on Gardner Bender heavy-duty cable ties. UL Recognized component. Ultraviolet black (UVB) ties resist harmful light rays – primarily for outdoor use. 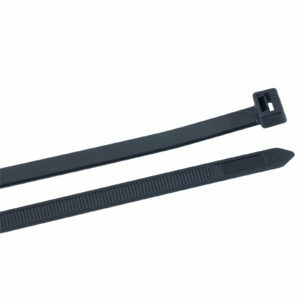 Gardner Bender makes by far the finest UV black nylon cable ties! The prices listed are based on the purchase of a single bag of ties. Please call for price breaks on larger purchases….. The nylon ties listed are kept in stock for immediate delivery.